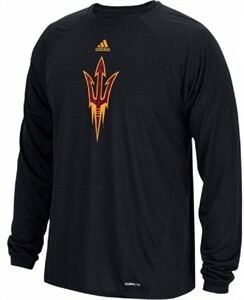 From the Adidas Sideline Football Collection the Arizona State Sun Devils Men’s Sideline Spine Synthetic Climalite Long Sleeve T Shirt from Adidas comes in Maroon with a standard-fit body that still gives you room to move. Made from 100% Moisture-Wicking Climalite Polyester Material that keeps you cool and dry no matter what your activity this NCAA tee shirt also features odor management. To show off your College pride this top features a screened front graphic and the school name in a vertical print on the back.